SET100 Ultimate is a single-ended hybrid amplifier of 2 gain stages, output power of 120W wrms with low output impedance (0.25 Ohm). It has the magic midrange of a small S.E.T amplifier with the scale, authority, micro and macro detail that no amplifier has ever achieved until now. It uses a specially designed single-ended mosfet output stage, coupled with a double c-core amorphous transformer. 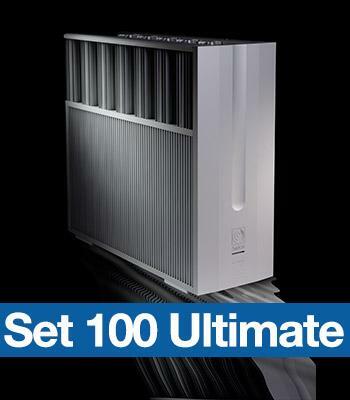 SET100 Ultimate has power and drive with transparency, musical involvement and above all with music sounding naturally. With only 2 gain stages in the signal path, the level of immediacy and transparency is unequaled by designs using more than 2 gain stages. Having no overall feedback, the distortion is kept comparably low while the output impedance is sufficient enough to drive real world loudspeakers. The first stage uses a high transconductancetriode, the SIEMENS EC8010 selected for its sonic capabilities and reliability. It is powered by a separate power supply with tube rectification and choke regulation. This stage is transformer coupled with the output stage. This interstage transformer is a state of the art component. It uses a proprietary double c- core material and is silver wound using a Swiss made pure silver enamel wire. Sonically it is virtually a nonexistent component. The output stage and all internal wiring is hard wired with silver wire extruded to our specifications. The power supply is designed as a system paying attention to every smallest detail that could affect the sound quality. It uses a low noise E-I power transformer, a big size differential mode power supply choke and 4 pole electrolytic capacitors. It is also hard wired with silver wire. Mechanical, magnetic and electrical noise is very low contributing to the quiet operation of the system. A darker background is produced from which sounds suddenly emerge like from real life. SET100 Ultimate is an amplifier that produces music in its true natural scale, but above all it brings you as close as possible to the music event, to feel the music rather than hear it, to be touched and overwhelmed by the deeper feeling, with music emerging and not only sounding in a clear undistorted way. Compared with conventional amplifiers it is more direct sounding and musical with more instrument body, lower frequency extension, frightening dynamics and most of all magically three dimensional. Its strong point is that in large orchestra crescendos it sounds transparent and totally unstressed until it reaches full power.
" Single Ended In All It's Glory "